In an emergency situation, a trash bag (namely the big, black ones my family uses for stuffing with raked leaves) can be an invaluable shelter to protect you from the elements. 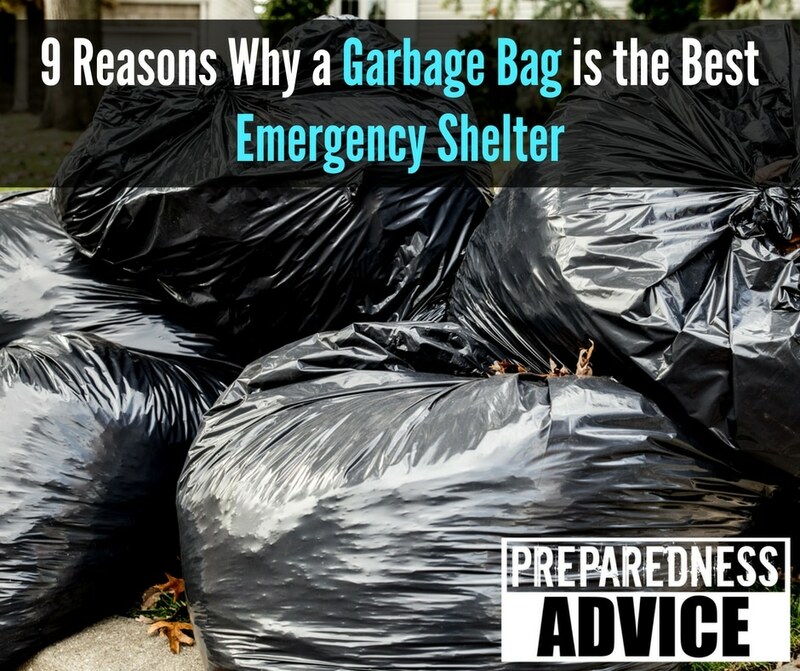 Let me tell you 9 reasons why a garbage bag is the best emergency shelter you can get in a pinch. But if there does happen to be a nearby underground, fully-stocked bunker with wifi, definitely go for that. In the meantime, keep 1 or 2 heavy duty, contractor quality trash bags in each of your bug out bags and a couple in the car. You’ll find they have many, many uses but as expedient emergency shelters, here’s why they’re hard to beat. They’re inexpensive. A big roll of black trash bags costs less than $20 from most hardware stores. When you put one to use, you won’t feel like it’s money down the drain, and, if you’re stranded somewhere for more than just a day, you’ll may be using several of these bags. Again, no problem because they aren’t high ticket items. They’re multifunctional. Use them as a rain tarp, a poncho, a sleeping bag, or an emergency shelter. The possibilities are endless. Once you’re cozied up in your trash-bag-emergency-shelter, you can use any other bags you have to protect your gear, fashion a wind or rain shelter, etc. They’re lightweight. A couple of trash bags stuffed in your emergency pack will weigh in at less than a pound, and will take up a trivial amount of space. This is an important factor when packing a bag for your kid or an elderly person. They get a versatile piece of gear without adding much bulk or weight. They can be modified for both concealment and rescue. For concealment, cover a black trash bag with mud and leaves. If you want to be rescued, go for a lighter color of trash bag, and put it (and yourself) somewhere very visible. Why not pack a black trash bag and then a red or yellow one. Use the brighter color for shelter, yes, but the plastic can also be cut into smaller pieces to use for signalling or for marking a path. They’re waterproof. Keeping dry in the wilderness can be the difference between life and death. Utilizing a trash bag as a rain poncho or tarp, or wrapping a couple around your shoes to keep your feet dry, might actually save your life. As a shelter, it may not be fun huddling inside while the rain beats down on your, but if the only other option is to become drenched, then the trash bag may possibly save your life. They’re pretty much one size fits all. While taller people might need two trash bags to hunker down in or under, most of us can get away with just one. Just remember that if the trash bag is going over your head, include a small hole or two near your face for ventilation. Kids will find it easy to put one to use as a shelter and as an expedient rain poncho. Smaller people will find that the bag not only fits over their body but over their backpack as well. They can be purchased anywhere. Even grocery and convenience stores carry them. If you find yourself stranded from home but can get to a gas station, there’s a very good chance you’ll be able to buy a box of trash bags. They’re quick and easy. It’s super quick to just slash a hole in a trash bag, then slip it over your head and stop for the night. Kids and old folks can do it just as fast, and it does not require any special equipment or training. Weather can change on a dime, making the trash bag an invaluable piece of gear. They’re suitable for many different types of terrain and weather. A thin layer of plastic may not sound like a good idea in a desert environment, but cutting one of these bags in half will create a large plastic sheet that can be used to create shade and at night, when deserts can become quite cold, getting inside a second bag will provide warmth and protection from moisture and even small critters. In colder climates, the bag creates an essential water-proof protection from rain and snow. This entry was posted in Shelter, survival. Bookmark the permalink. Another use is to gather leaves or boughs, placed inside a trash bag, mattress ready to be placed into another or underneath the shelter bag, join a couple together to construct a tube tent, another use for duct tape. Black plastic bags are good for a lot of stuff, there is a lot of good information in this article. Plastic has to be one of the inventions that are in the top 10 list of all times. Good Post! they can EVEN RESIST BARF! Beware of those bags treated with insecticides, fungicides and or “perfumes.” Not health for prolonged contact – or food use.